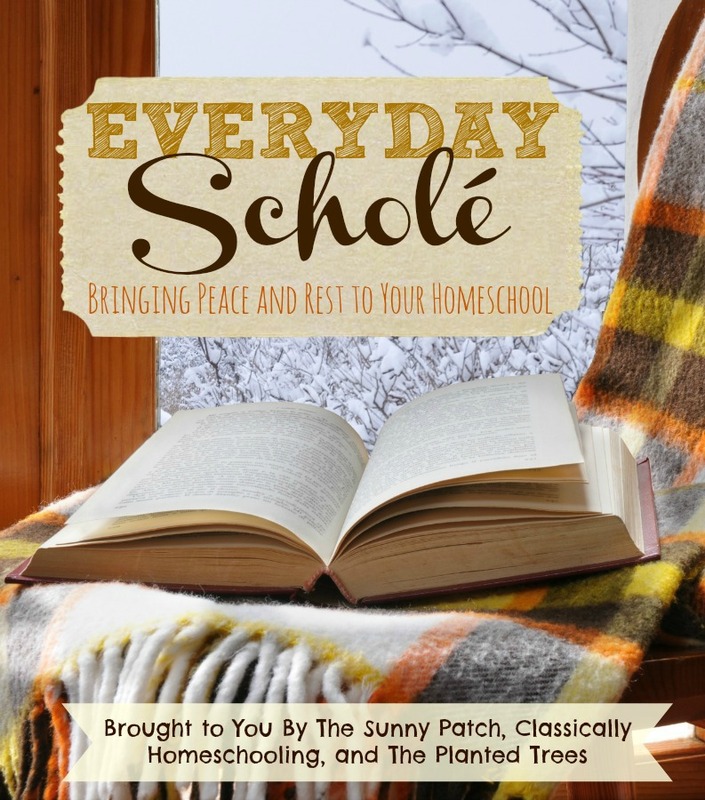 There has been quite a bit of talk in Classical homeschooling circles about restful homeschooling (scholé) and finding peace in your homeschool journey. Many of the discussions focus on the philosophical side of the coin. But, I'm a fairly practical person and, while I can appreciate a philosophical discussion, I prefer to focus on the 'how-to'. So let's flip the coin and look at the practical application of finding your place of peace. I am very happy to tell you that I'm not alone in this journey! My good friends Chelli & Sara are traveling with me on this adventure. Every month we are going to be talking about a different aspect of Classical education and how that looks in each of our homes. We're not sharing because we think we have it all together! We're simply sharing because sometimes it is just so helpful to get a look at how someone else is doing something. And instead of getting a glimpse of ONE homeschool - you're getting a peek at THREE! For our first chat about Everyday Scholé we are focusing on Morning Meeting resources. If you are new to the term, Morning Meetings are simply a time to gather all your children together for a time to cover subjects and topics with all your children at one time. For many, it's an important part of their day before all the children head off for their various academics and pursuits. Many people use this time to have family devotions or to discuss art or music or read aloud. Some have Morning Meetings that take a few hours each day. Others may have meetings that take 30 minutes. Morning Meeting will look quite different in each home - next month Chelli, Sara, and I will be talking about that! This month we're going to take a look at resources for that morning meeting time. Our daily Morning Meetings are fairly short compared to many others at just 30 minutes. But we pack those minutes full of great things! We begin our meeting time with Bible reading and then follow that up with some reading aloud while TJ works on various projects. Occasionally, I try to squeeze in a few extras (but that doesn't happen often). Every meeting begins with our devotional time. Bible reading - TJ reads a chapter from the New Testament (her Bible). Scripture recitation - we try to memorize a new portion of Scripture every 6 weeks. Character discussion - using our Virtue Training Bible we discuss one virtue each week, reading a few verses each day. A Child's Geography (volume 2 & volume 3) - I read a section a day while TJ draws or does a project. Old Testament & New Testament Activity Paks from Homeschool in the Woods - TJ works on these while I read to her. Once in awhile I try to squeeze in some Shakespeare by reading a story from Tales from Shakespeare. A few times a week we add in a few Red Herring Mysteries (usually when Nick is home because it's more fun with more people discussing the possible scenarios). Art, music, and poetry have been put on the back burner this year. As much as I'd like to squeeze in everything possible we just haven't made much time for these. We occasionally pull out a few resources but it's not as often as the books I listed above. My friends Sara & Chelli are also sharing a look at their Morning Meeting resources. Go visit Chelli at The Planted Trees and Sara at Classically Homeschooling to find more inspiration for finding your own place of rest.